Quietly, gradually, the man felt sleep depart. He felt his eyes begin to open in the pitch-black night, in the midst of so much stagnation and cold pressure. A barely audible sound – shhh – followed by something that sounded like punctuation – ta. Shhta shhta shhta. What were these quiet sounds that reached his ears? The sound of dripping water? His upper and lower lashes began to separate of their own accord in the congealed darkness frozen around him. We soon find out that this is no ordinary awakening as the setting for this opening scene is actually a tomb. The being trying to come back to life is a prince executed on trumped-up charges of treason and buried on a mountain not far from the (then) imperial seat of Nara. Several generations have passed since his death, and some unwise behaviour from the locals has caused him to stir from his slumber, but there’s another reason for the interruption to his rest. You see, in a building belonging to the temple at the foot of the mountain, a young noblewoman is preparing for an extended stay. Having ventured into areas forbidden to women, she has been ordered to remain within the temple precincts in order to atone for her trespasses. Once her retinue catches up with her (this was a rather furtive solo outing), the maiden settles in for an uncomfortable stay in what is little more than a hut. It doesn’t help, though, that sleep is hard to come by as there’s something in the shadows when she tries to close her eyes. Could it be that someone, or something, is trying to reach out to the young woman? I had very hopes for The Book of the Dead, and I certainly wasn’t disappointed. It’s a modern(ish) novel with an ancient feel, a clever story where the simplicity of the action belies its complex genesis. Orikuchi was a folklorist and academic, and he uses several events and myths from his ethnological studies to create the work. Shiga Tsuhiko, the man in the tomb, is based on Ōtsu, a prince who died towards the end of the seventh century, and the woman he sees before his death, Mimimo no Toji, has imprinted herself in his mind, leading to his belief that she is calling him. In fact, Mimimo has been dead for decades, but the nameless maiden who has wandered into the vicinity is a descendant of the ancient beauty. She senses the spirit when it enters her hut each night, yet instead of running off screaming, she decides to stay and do her best to put her visitor at ease. The connection between the two main characters grows, even if there’s no actual contact, culminating in the woman’s decision to create a shroud to enable the departed prince to finally rest in peace. Her education, consisting of copying sutras, is an attempt to learn more about the outside world, and her sudden, unexpected flight now allows her to see the real thing. Orikuchi’s attempt to bring the past to life makes for excellent reading. He shows the reader of the time how his characters (living 1200 years earlier) would have spent their days, and the core story is only enhanced by what surrounds it in this edition. Angles (whose excellent work on the book was rewarded this week by a longlisting in the (American) National Translation Awards) provides an extended introduction in which he discusses the inspiration for the novel. The writer apparently took inspiration from several Japanese myths, quite apart from that of the executed prince, including one relating the creation of a woven ‘mandala’ (as happens in the novel). In a sense, the way the maiden weaves the fabric is symbolic of how Orikuchi creates his story by using elements from various sources. Also included here, again translated by Angles, are three essays of commentary by critic Andō Reiji, featuring detailed insights into the sources for the novel. 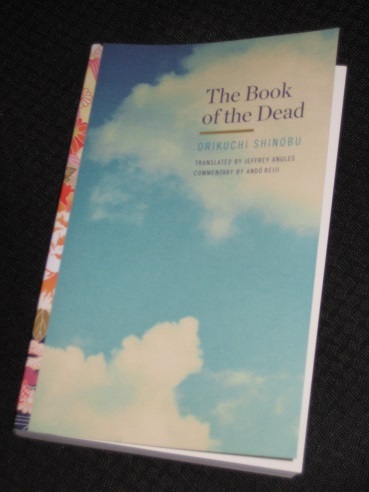 Apart from the inspiration for the content noted above, Andō explains how the novel may contain veiled criticism of the right-wing government of the time of writing, and also claims that the book is an homage to Orikuchi’s dead lover. It’s all rather intriguing, but in truth, after Angles’ introduction, these sections come across as a little superfluous and repetitive (I suspect they’re here more for academics than for casual readers like myself). The actual novel is fairly short at around 100 pages or so, but there’s a lot to explore and discuss – I won’t say any more as Angles and Andō have done it much better already. I’m a sucker for classical Japanese literature, so I was always going to love this, but I wouldn’t expect every reader to find it as much to their taste. However, if you are into something a little more esoteric (and don’t mind a bit of scholarly exposition), it’s well worth a read, and an excellent insight into a time and culture far removed from our own. Well, I didn’t need the reference to Genji to be attracted to this one… sounds like a very enticing proposition indeed. I was thinking more of real anime or manga, like this https://en.wikipedia.org/wiki/Ceres,_Celestial_Legend, in which the main character is thought to be the reincarnation/descendant of a celestial maiden. Yoko Matsumoto’s mystery manga also have used similar storyline: https://www.goodreads.com/author/show/1987859.Yoko_Matsumoto. One of the male character is (falsely) thought of by a wandering Princess spirit to be the reincarnation of her lover in past live.